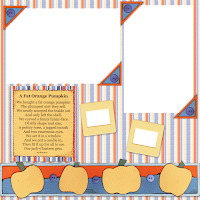 This layout is the result of our trip to the Pumpkin Patch, again this is from last year. The girls were scooping out pumpkin goop so Patricia could roast them. Look at Victoria's face! She is thoroughly disgusted! Click on photo for credits. QP's are a great choice for those of us who are short on time, but want to produce quality layouts. Just add photos and journaling and your layout is ready to print. Great layout! Love the blue and orange together. You sure know how to digi! Looks fun! I love your digi layouts! They remind me I can get more done, too!